Greetings From The Starcat Cluster ~ It's The Place in Space! A combination picture-book, scrap-book, postcard book fun for Cat Lovers of all ages! Dynamic illustrations by artist, George Angelini, bring Halborn's text-in-rhyme and silly jingles to life! Scrapbook in photos of your kitty! Share the 12 perf'ed postcards with friends! 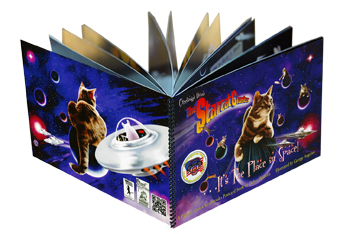 Light up your word power: take The Starcat Vocabulary Challenge! A portion of every book sold is donated to Feline Rescue across the USA. 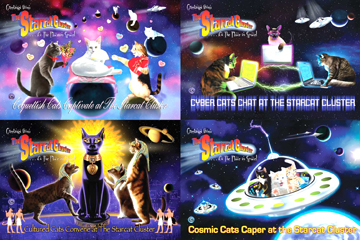 Comments for Greetings From The Starcat Cluster ~ It's The Place in Space! 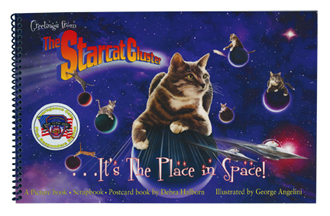 I highly recommend the book, "Greetings From the Starcat Cluster: It's the Place in Space!" As a librarian I appreciate the alliteration and rhyme. As a grandmother, I appreciate how the author inspires children and adults to appreciate cats AND an exceptional vocabulary. And as a cat owner, I appreciate how the author entertains us with her creative view of cats. 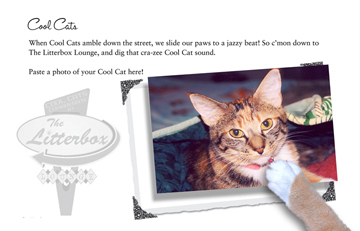 The book is enjoyable as a picture book, but also allows the reader to be interactive in adding our own cat photos AND provides beautifully illustrated postcards to send to friends!